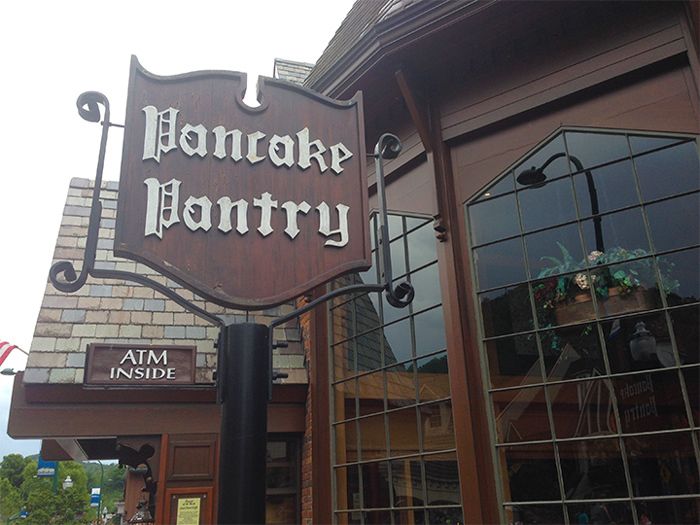 Where are the Best Pancakes in Gatlinburg? 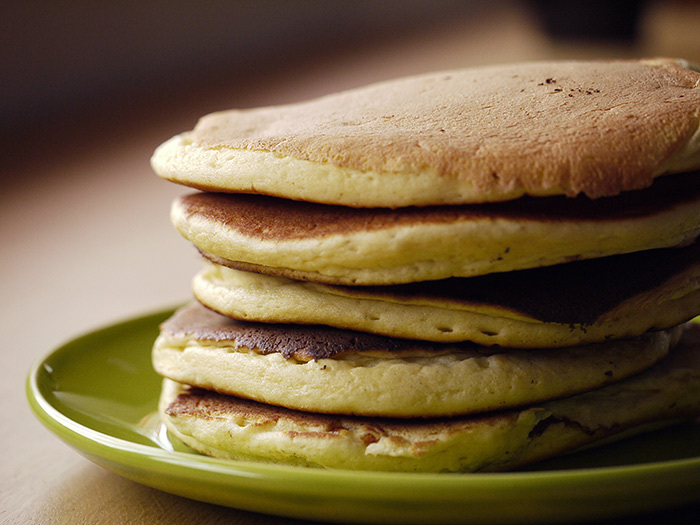 Nothing quite says "Breakfast in Gatlinburg" like a warm, tall stack of pancakes on a chilly mountain morning. But, with so many pancake houses to choose from, where do you begin? Our guide to the best pancakes in Gatlinburg let's you know what's good (and not so good) about all the pancake houses in Gatlinburg, so you can decide where you want to indulge in the sweetest of breakfasts - a syrup-drenched stack of fluffy pancakes. The original pancake house in Gatlinburg as well as the first pancake house in Tennessee. Pancake Pantry has been a Gatlinburg staple since 1960 and set the trend for all the pancake houses that followed. Resting in the Gatlinburg Village, this restaurant features a warm, wooden interior, slated roofs, and a European-inspired menu. And while it may not transport you back to Bavaria, it's 1970's décor and the servers uniforms are nostalgic in a completely wonderful way. Austrian Apple-Walnut Crepes- These silky crepes are served with an apple cider compote made from black walnuts, apples, and spices that will have you thinking you're in the Alps and not the Smokies. Sweet Potato Pancakes - With a batter made from a blend of cinnamon, golden wheat, and sweet potatoes, these pancakes come topped with whipped butter and cinnamon cream syrup for an indulgent Southern treat. Smoky Mountain Buckwheat - A classic mountain treat! Topped with syrup and whipped butter. Swedish Pancakes - Delicious egg batter crepes topped with lingonberries imported from Sweden. You'll be saying "Ja!" to these rich crepes served with lingonberry butter, powdered sugar and lemon wedges. One helpful tip about this restaurant - it's cash only. While there is an ATM at the restaurant, you might want to save on ATM fees by bringing some cash with you. Open 7am-4pm during the peak season and 7am to 3 pm during the off-season, you might want to plan for a wait at this popular destination. Arrive early (before 9 am) or late (after 2 pm) and you might save you from that ever-present line that seems to form outside this restaurant. On homage to the "King of the Wild Frontier" himself, Crockett's Breakfast Camp is another option for pancakes in Gatlinburg. It offers a rustic interior that features reclaimed wood accents. What's not rustic is it delicious and unique menu that is sure to leave an impression. Cinnamon Roll Swirl Pancakes - A delicious fluffy pancake with cinnamon roll glaze swirled in the batter. Pecan Waffle - Okay, so this is technically a pancake, but this waffle that's topped with pecans and topped with sliced bananas and a side of caramel definitely fits the bill for a sweet breakfast. Crockett's Breakfast Camp is open 7 AM to 1 PM every day of the week. There's plenty of seating at this restaurant, which means that you're less likely to experience a wait. Gatlinburg has its fair share of mom and pop pancake house, and The Atrium is another place to try pancakes in Pigeon Forge. This Gatlinburg eatery has been in the area for about 20 years, but still maintains that warm, inviting atmosphere of a small, family-restaurant. There's also a seating area that looks out on an impressive water feature for added ambiance to your Smoky Mountain breakfast. Baked Apple Pancake -This is what to get. Looking more like a cake than a traditional pancake, this deliciously sweet breakfast dish is baked with fresh sliced apples and brown sugar with delicious fluffy pancake batter. Chocolate Covered Strawberry Pancakes - Chocolate covered strawberries are an irresistible treat - this pancake inspired by the indulgent treat is topped with strawberry compote and a chocolate fudge sauce for the most decadent breakfast ever! M&M Pancakes- Kids will love pancakes topped with a helping of M&M candies! The biggest downside to this pancake destination in Gatlinburg is that parking is scarce, and that you might have to walk to this restaurant from another parking lot. Hours are 7:30 a.m. to 2 p.m. daily, so plan on arriving early. One final note, many reviewers have noted to ask for your compotes on the sauces, so you can make sure you have just the right amount of deliciousness. Another one of the best places for pancakes in Gatlinburg is the Log Cabin Pancake House. Family owned and operated since 1976, this pancake house rests right in the heart of Downtown Gatlinburg and located near the Space Needle. Cornmeal -The tenderest of pancakes topped with margarine and served with honey or syrup. 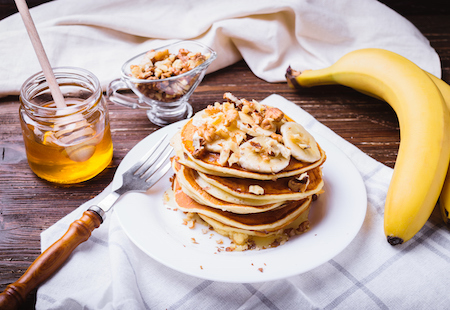 Caribbean - Enjoy a bit of the tropics in the Smokies with this banana pancakes topped with bananas, nuts, coconut, and powdered sugar. Parisienne Crepes- A strawberry compote wrapped in hot crepes and topped with powdered sugar, whipped crème, and more strawberries. C'est Magnifique! This is the destination for early birds looking to get some pancakes in Gatlinburg. Open from 6:45-2 pm. You can grab a delicious breakfast before your hike. There are several Flapjacks locations located in the Great Smoky Mountains area, but that doesn't mean you can't enjoy delicious pancakes in Gatlinburg! Sticky Bun - A cinnamon swirled pancake topped with pecans and drizzled with creamy icing is a sticky, sweet treat. Reese's Peanut Butter and Chocolate Chip - Enjoy a pancake rendition of this classic candy with a pancake topped with chocolate and peanut butter chips and drizzled with peanut butter sauce. Fresh Fruit Crepes - Stuffed with Cheesecake custard, you can choose from strawberry, blueberry, mixed berries or bananas. Flapjack's is great for accommodating large groups of people, so it's perfect for family reunions or church groups. Just make sure to go to their website to fill out a form on their website for groups of 25 or more. This restaurant has the most constrained hours and is open 7 am to 12:30 pm through the week and 7 am to 1 pm on the weekends. It's hard to pinpoint exactly who has the best pancakes in Gatlinburg with so many great options to choose from. 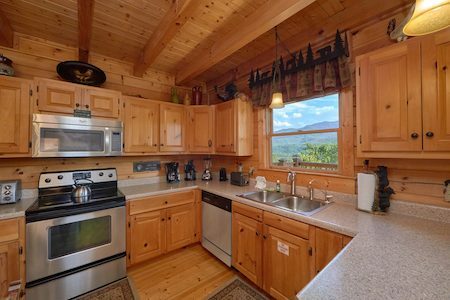 You can even make your own pancakes back at your cabin in Gatlinburg for a memorable breakfast in your cozy cabin. 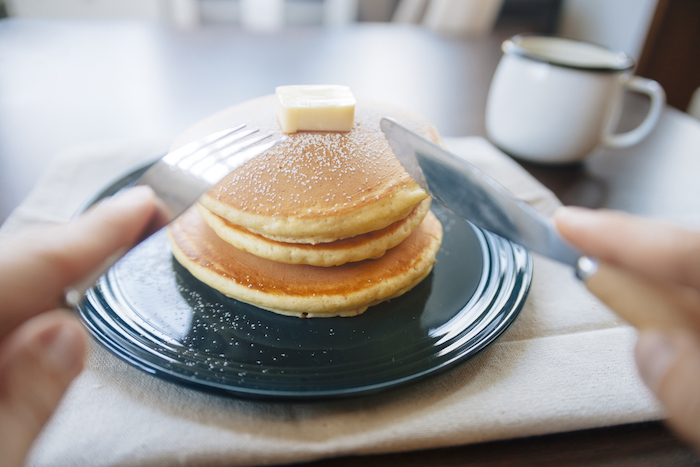 Wherever you chose to enjoy pancakes in Gatlinburg, we're sure you'll eat every last delicious crumb of your plate with these delicious options available.